Two facebook-related freebie thingamibobs in 24 hours? We must be approaching the season of goodwill or somefink! 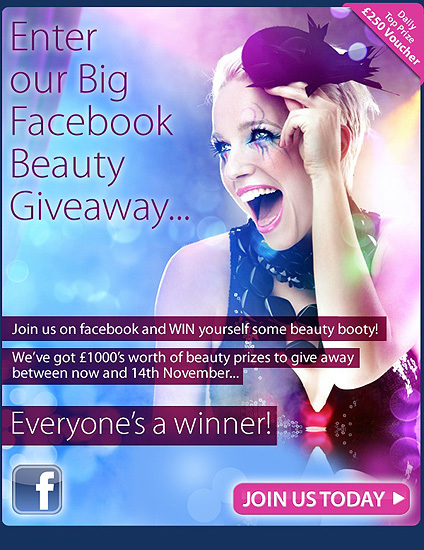 You have until the 14th November to bag yourself some daily wins over on Feel Unique’s facebook page. There’s £250 up for grabs daily alongside some guaranteed discount codes. To enter (and get a discount), ‘like’ the Feel Unique facebook page and fill in your details… note that by completing the entry form you’re agreeing to receive the Feel Unique (I nearly abbreviated that before thinking better of it!) newsletter… but you can unsubscribe at any time. Is this open internationally or just for people in the UK? Bare Escentuals invite women to Try. Believe. Love.